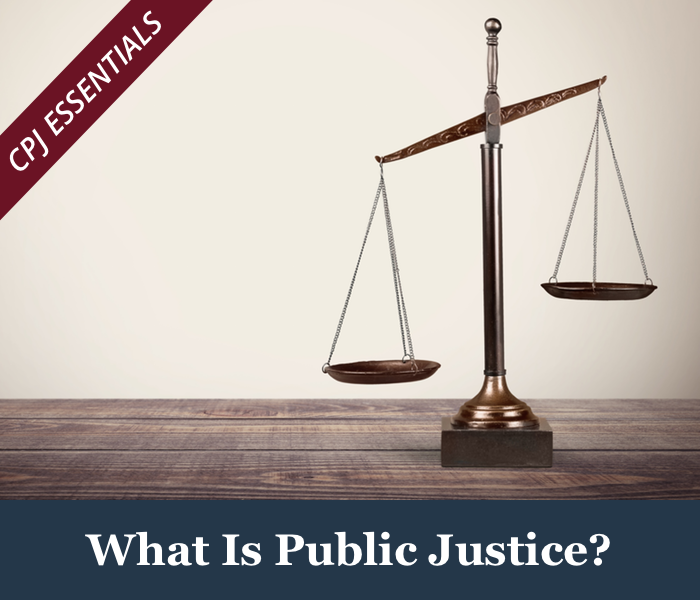 What Distinguishes the Center for Public Justice? 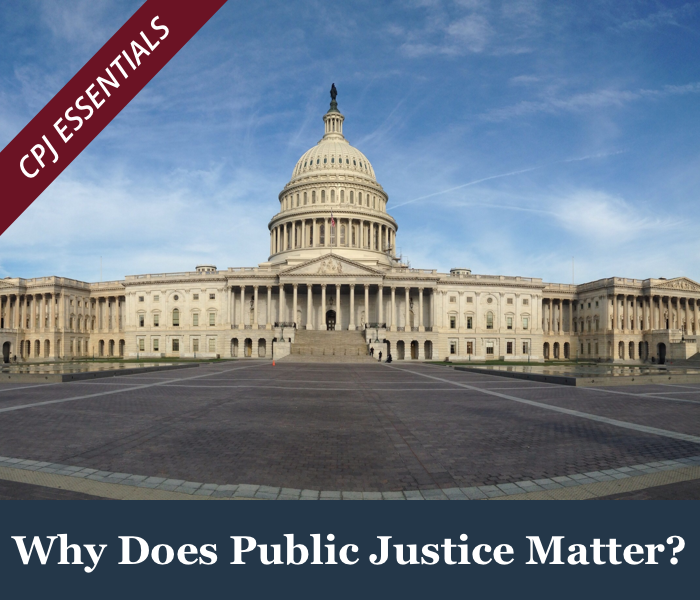 The Center for Public Justice approaches government and citizenship from a wide-ranging, comprehensive perspective. CPJ seeks to do justice from a Christian-democratic perspective by recognizing different religions and points of view and keeping the public square open to people of all or no faiths. CPJ believes government's authority is not limitless and that it should respect the responsibilities and rights of individuals and organizations. We seek to act with a comprehensive, constitutional concern for political life in all of its dimensions--domestic as well as international. CPJ is a nonpartisan organization engaged in public policy development and civic education. It approaches government and citizenship from a wide-ranging, constitutional perspective. That is to say, its concern is with what should constitute a just political community. CPJ's work is oriented toward the full scope of responsibilities that belong to citizens and all branches of government. Politics in the United States has become increasingly issue-oriented, short-term, and pragmatic. Citizens approach government primarily as a means to achieve the ends that various interest groups, regions, or sectors of society hold dear. Politics often amounts to little more than interest-group competition among diverse groups, each seeking its own goals. Too little attention is given to the soundness of public institutions, to the art of long-term constitutional statecraft, and to the common good of the republic as a whole. The prevalence of interest-group politics fuels an electoral process in which candidates raise money from special interests and typically appeal to voters on a narrow range of issues. Think tanks do research, some of it quite detailed and in-depth, but most of it focuses narrowly on particular issues, with little concern for other, equally vital matters. The political parties, interest groups, think tanks, and most citizens tend to take for granted this system along with the dominant ideologies and American civil religion that fuel the action. By contrast, CPJ starts with the assumption that interest-group politics, the electoral system, and the dominant ideologies call for critical assessment from a comprehensive, public-justice perspective. CPJ's point of view can be called Christian-democratic, which entails a commitment to principled pluralism and the common good. CPJ believes that the public good of the American commonwealth, which is shared by all citizens, can flourish only when governed by standards that transcend interest-group competition. Clarifying the demands of public justice for the common good thus requires a critical assessment of the entire political system, the dominant political ideologies, and the process of issue-oriented pragmatism. While CPJ has some of the characteristics of a think tank and of a civic-education organization, its viewpoint and purpose give it a more comprehensive orientation. Our approach to public life presumes that political practice either conforms to or violates standards of justice, including distributive and retributive justice. For this reason CPJ orients itself comprehensively toward the institutional framework of American political life in order to try to help clarify the criteria by which citizens and officials ought to be making sound judgments about the republic's well-being. CPJ believes that sound statecraft is possible and that citizens should respect public officeholders and cooperate with their leadership in the pursuit of justice. In the long run, CPJ is aiming to help nurture a new generation of principled, visionary citizens and political leaders. We want to foster a new politics, a renewed sense of public responsibility among citizens, and a forward-looking, comprehensive approach to public life that will lead to a more just republic and international order. Americans are awakening as perhaps never before to the public power of religion both in this country and around the world. Nevertheless, the dominant assumption about religion in the United States continues to be that religion is a private matter and should be confined to church life and associated activities. Public life, on the other hand, is presumed to be rationally secular. At CPJ we stand firmly opposed to the public establishment of any religion, but we reject the idea of a sacred/secular dichotomy that would confine religions to a private sphere. Religions are ways of life and not merely ways of worship. The question, then, is how to do justice to diverse religions and points of view while keeping the public square open to people of all faiths and points of view. This is the challenge that CPJ believes can best be met from a Christian-democratic starting point. A Christian-democratic approach to government and politics calls for equal treatment and equal public room for people of all faiths. This approach contrasts sharply with "sectarian" and "theocratic" approaches that seek government-backed privilege for one religion or ideology above others. At the same time, we stand opposed to a secularized public square from which religious voices and practices are banned. Perhaps the best way to explain these assertions is to contrast three different, historical versions of "Christian" politics. The oldest version is the one most people still have in mind when they argue that religion--Christianity in particular--should be banished from public life. What they want to banish is "Christian" imperialism. That was the system that characterized European Christendom for more than a thousand years until the 16th and 17th centuries. During that era, the model for public governance and social organization derived from the old Roman imperial system. The aim was for the church to organize society and guide political authorities for the purpose of building a Christian community. A second version of "Christian" politics emerged with the gradual breakup of Christendom and the rise of the modern state around the time of the Reformation. It can be called "Christian" nationalism. Christianity, in this case, is the faith that is given privilege throughout a state's territory. Not all citizens need to hold the state-approved faith, and those who do not may be allowed to worship in their own institutions. But the state upholds or privileges the Christian religion (or a particular church) as the moral guide for public decisions and the glue that holds society together. Ironically, the pattern that was established by Christian nationalism opened the way for competing secular and civil-religious faiths to displace Christianity as privileged faiths or ideologies. When the nation or the state takes first place in the lives of its citizens, the outcome may not be one that sustains Christian nationalism. The outcome might be the privileging of a civil-religious or secular-ideological form of nationalism. Much that passes for "Christian" politics in America today--left, right, and center--represents a form of civil-religious nationalism, which combines elements of Christianity with a modern ideology of freedom-idealism. Many Christians throughout our history have thought of America as a nation specially chosen by God, a new Israel. As this idea of the nation emerged from Puritanism and gradually became secularized, it gave rise to the conviction that "sectarian" faiths (Protestant, Catholic, Jewish, and others) should confine themselves to private institutions and activities so that a nonsectarian faith and ethos could bind all citizens together in the public square. For many Americans the proper common faith is the one that is compatible with Judeo-Christian morality. Others, however, believe that the common faith should be a secular ideology of individual and national freedom. In both cases, the common faith or ethos is supposed to control the public life of the nation while the different religions are supposed to confine themselves to private churches, synagogues, and mosques. Rejecting both imperialism and nationalism, the Center for Public Justice believes that a more consistent approach to governance and citizenship has the character of a response to God's call to do justice. Public justice in this case means justice for all--for every citizen in the political community. We call this approach Christian-democratic orChristian-pluralist. The starting point is found in recognizing that political communities--constituted by governments and citizens--all play their role in the unfolding drama of world history, a history in which God's authority and purposes transcend all nations and states. No nation or state may claim to have instituted God's rule in a way that justifies casting out or treating unfairly citizens who disagree with the government-established faith. On biblical terms we believe that God's purposes revealed in and through Jesus Christ call for neither church-governed societies nor governments that give a privileged public place to Christians. Rather, a Christian-democratic approach recognizes that God through Christ is upholding and renewing human responsibility on earth, including the responsibility to govern. And since God continues to send rain and sunshine on the just and unjust alike, and since Christ did not call his disciples to try to establish God's kingdom by force, human governance requires the just and equal treatment of all citizens. Just governments, in other words, should be constitutionally established to legislate and adjudicate laws for the common good of the entire political community, assuring equal treatment of all citizens regardless of their faith. Therefore, Christian politics should mean, among other things, that Christian citizens, without any public privilege, will seek to live at peace with all people and will work to build states and an international order to promote justice for everyone. The Center's philosophy of principled pluralism flows directly from its conviction that governments have not been ordained by God for the purpose of separating believers from unbelievers, giving privilege to Christians and the church, or serving the interests of one nation over others. This is a religious conviction that mandates publicly established religious freedom for all. Governments have the high calling to uphold public justice for all people living within their territories. States are not churches or families; public officials are not national theologians or clergy. States are public-legal communities that exist for the protection and enhancement of the common good. First, it means recognizing that the state itself is but one institutional community among others in society. The American republic, as a political community, is part of a diverse social landscape that includes families, businesses, schools and colleges, social-service organizations, and much more. The jurisdiction of American federal and state governments is (or should be) limited to the making, executing, and adjudicating of public laws for everyone who lives under the jurisdiction of those governments. The authority of government is not limitless. Governments may not ignore or displace other kinds of human responsibility in other institutions. Pluralism also means, therefore, that government should recognize and uphold the diverse organizational structure of civil society. Government should not treat human beings merely as individual citizens; human beings also exist as family members, faith-community members, economically organized employers and employees, and in dozens of other capacities and relationships. "Principled pluralism" means that government is obligated to do justice to society's nongovernmental organizations and institutions as a matter of principle. This is why the Center for Public Justice is concerned with the order of society and the proper relation of government to the many different kinds of human relationships and organizations in society. Finally, pluralism means that there should be constitutional recognition and protection of religious life in society. Principled pluralism means that government should give equal treatment to different communities of faith. Government should not have the authority to decide what constitutes true religion. Therefore, government should not try to establish one religion or to enforce secularism in public life. Most religious ways of life seek expression beyond the walls of a church. Most guide their adherents in the way they should live in society and not only in their worship and creedal confessions. Justice, therefore, requires equal treatment of religions in public as well as in private life. All three of the meanings of pluralism articulated above are essential to the Center's Christian-democratic, principled-pluralist understanding of a just political community. The Center for Public Justice is an American organization focusing primarily on domestic governance and civic responsibility. But the Center also addresses foreign policy issues and international relations. Christians in every country throughout the world need to see their citizenship as subordinate to the wider, higher, global purposes of God in history and thus recognize their own obligation and that of their governments to promote international justice. First, human governments bear limited authority--not only with respect to other institutions in society but also with respect to other governments in the world. Consequently, governments around the world share in a worldwide responsibility to uphold justice. Each state on earth is but one territorial government under God's transcendent, worldwide authority. Moreover, there are many dimensions of our shrinking world that call for more than simply state-to-state cooperation on a bilateral and multilateral basis. International and even transnational institutions of governance are needed to do justice to the international commons. Second, the biblical story teaches us that Christians throughout the world share something that binds them more closely together than does their domestic citizenship. Christians of every state and nation should recognize that they share a common commitment to do justice beyond their own nation. Insofar as Christians nurture this insight and bond, they should be able to learn from and encourage one another across national borders in order to fulfill their civic responsibilities both domestically and internationally for the good of all their neighbors. Christians acknowledge that particular governments have God-given authority, but Christians also profess that everything ultimately belongs to God, including the responsibilities that belong to human governments. This emphasis on international order, community, and justice brings us back to where we started. The Center holds a perspective on political life that differs in important ways from the perspectives of many American political groups, some of them Christian, others not. Our commitment is Christian and democratic, in support of public pluralism as a matter of principle. We want to act with a comprehensive, constitutional concern for political life in all of its dimensions, domestic as well as international. These characteristics distinguish the Center for Public Justice. For more on what distinguishes the Center, see our Guidelines for Government and Citizenship.